Ensures the safety of your boarding passengers by providing a barrier between the boarding area and the ramp. Also helps prevent the accidental dropping of foreign items onto the tarmac. 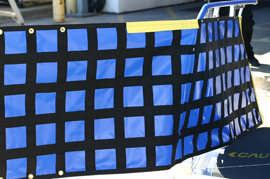 Available as solid or mesh fabric reinforced with sturdy webbing. Customizable to your specifications.